Let’s look at the science, art and value of trees and many ways we can love (and profit ) from them. I love reading Elizabeth Barret Browning’s Sonnet 43 “How Do I Love Thee”. I think first about my wife, children, mom, sister, friends and you, the reader, who adds so much purpose in my life. This sonnet also reflects how I feel about trees. Recently I was speaking with Tom Kerr, the editor of Independence Monthly about qualities I seek when looking at real estate. One quality I pointed out was “I look for trees“. Tom’s conversation on this subject sparked my imagination about the value of trees. 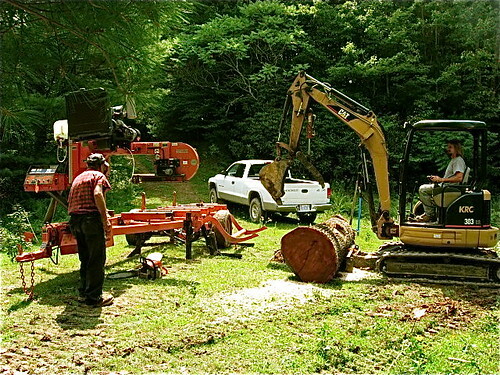 “Logically,” I told Tom, “trees offer logging opportunities”. 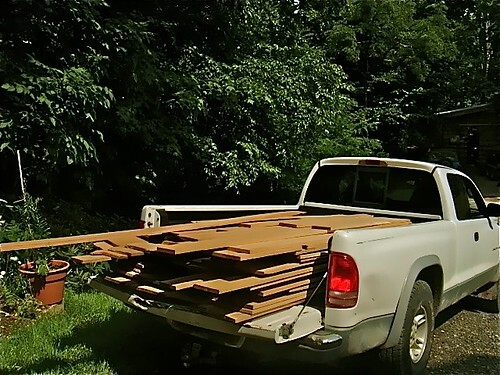 Sometimes land can be purchased for less than the income logging the trees will bring. Then I have to be honest, even though sustainable logging can help a forest, Merri and I have not been able to bring ourselves to log a single live tree for the 20+ years we have been on our farm. There are so many other ways to profit from trees. “Let me count the ways”. First, there are health benefits. An article at the National Library of Medicine “What’s in a Color? The Unique Human Health Effects of Blue Light ” (1) show that color has an impact on our well being and health. The article says: A major milestone came with the 1998 discovery of melanopsin retinal ganglion cells, a new type of photoreceptor in the eye. These cells provide signals to the suprachiasmatic nucleus (SCN), the brain’s master clock. They project to many other brain regions as well, influencing myriad aspects of human physiology. Researchers have shown in humans that light influences hormone secretion, heart rate, alertness, sleep propensity, body temperature and gene expression. Another article at Livescience.com “Does the color green boost exercises effects?” (2) zeros in on some health benefits from the color of green. Working out in the great outdoors may produce more psychological benefits than hitting the gym, suggest researchers who say that “green exercise” may boost mood, self-esteem, motivation and enjoyment. But according to a new study, the positive effects of green exercise may have more to do with the color green than with being surrounded by nature. The study is the first to show that the color green may contribute to the feel-good benefits of outdoor exercise, the researchers said. The findings were published in the journal Environmental Science and Technology in August. In other words, we gain health benefits from blue skies and green forests! I definitely make sure I surround myself with green when I exercise. 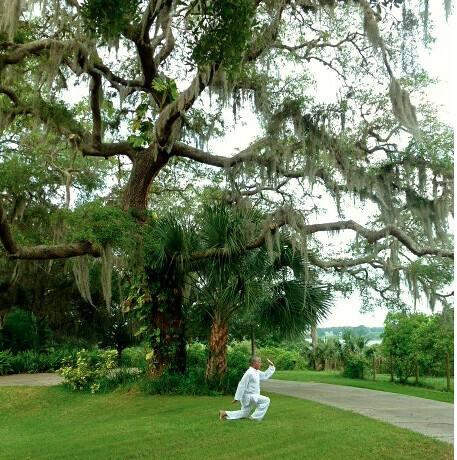 Exercising by the oak in our Florida front yard. We have numerous huge oaks at our Florida home. One grows right through the middle of our houses. This tree makes an absolute mess of leaves every year. We love it! I use trees in play. 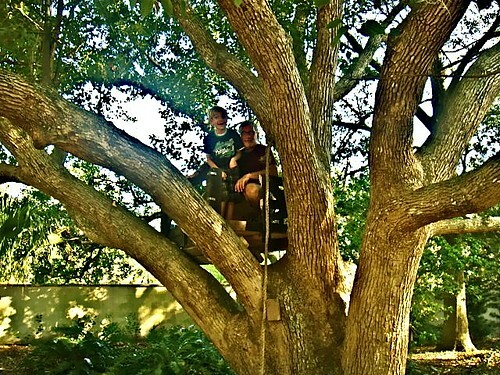 My grandson, Garren, and me in a tree house we built in our back yard. When my brain won’t fire right in North Carolina I pack up my computer, get the hounds and go work while sitting under a tree. The satellite image above is of our house at the farm. The house is at the top of the lower left meadow. This sums up how we like trees. 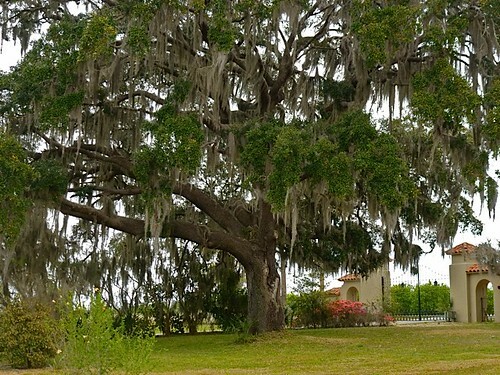 The hundred year + oak below at the entrance of our Florida house, and six others around including the one growing in the middle of the house sold us on our home. We earn income from wood. I have never been able to log live trees but when they fall on their own, we harvest them and put them through a portable mill. The wood is cured and used for different things. We used this lot from a big poplar that died behind our house. 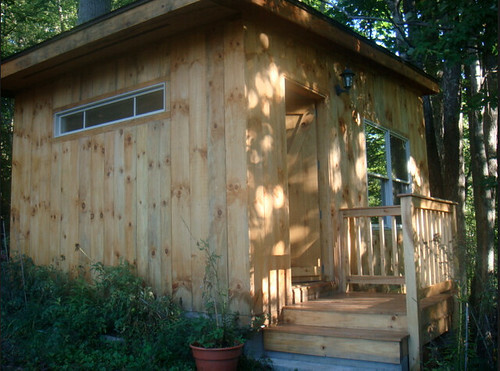 We used it to build our meditation and exercise Forest Room (below). the trees and blue sky. Most summer days we eat on our porch while looking at trees. 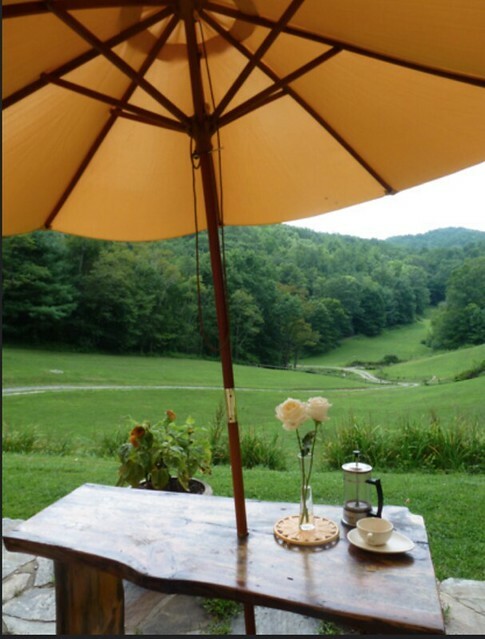 (The porch table by the way came from a tree we salvaged on the farm.) We build and sell them to add a bit of income to the local economy. is among the last things you will forget when the veil falls. with dew in its hair. A March 2017 National Geographic article “What We Can Learn from Trees?” (3) also shows and tells why we should look upon trees with wonder. 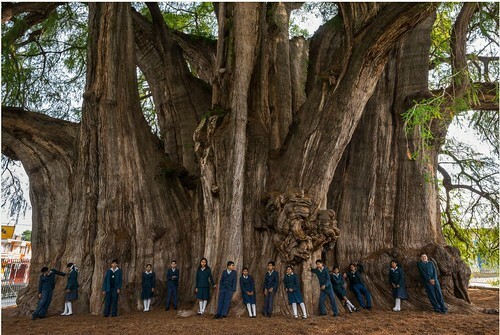 a Montezuma cypress known as el Árbol del Tule. The trunk, 119 feet in circumference and roughly 38 feet in diameter, supports a crown the size of almost two tennis courts. 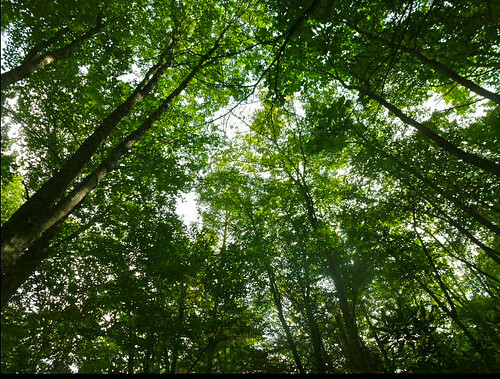 Here is another spectacular lesson we can learn from trees the article shares. Made up of 47,000 tree trunks covering 106 acres and weighing some 13 million pounds, is real. 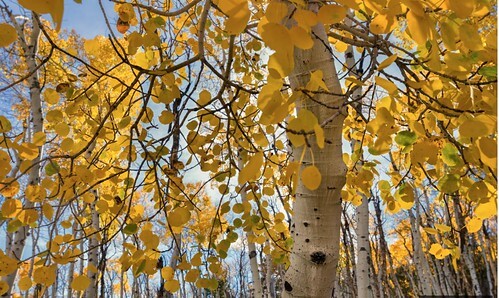 It’s a single organism, a quaking aspen that began life as a single seed—possibly tens of thousands of years ago—and spread by sending up shoots from an expanding root system. (Pando is Latin for “I spread.”) Each trunk is genetically identical and no more than 150 years old, but the root system may be the oldest living organism on the planet. That’s quite a lesson in longevity, of harmony and unity. Maybe we should look harder at the wisdom of trees in our modern divisive world! Whatever your reason for looking at real estate, to live on, to profit from or to protect, next time you look, stop for a moment (or two) and reflect on how many ways you can love the trees. Learn about Independence Monthly below, a publication that can help you live a simpler, richer life among trees. Here is how to take back control of your life as big business launches its most serious attack on being small. Well’s Fargo is back in the news. Last year the bank paid $185 million in penalties after creating 3.5 million unauthorized consumer deposit and credit card accounts just to meet aggressive sales goals. Then in July 2017, it was revealed that hundreds of thousands of Wells Fargo customers were charged for auto insurance they did not need. An Office of the Comptroller of the Currency report says Wells Fargo may need to refund customers more than the $80 million for this cheat. Now we are reading about an investigation into the bank’s the foreign-exchange dealings. The cheating culture at Wells Fargo is just one example of how big businesses and government acts like we, the people, don’t matter any more? The only leverage we had, the threat of taking our business elsewhere, or changing our vote seems to have gone up in smoke? We are caught in “take it or leave it. We have become numbers caught in a system”. Has big government, big pharma, health care or big business ever made you feel ripped off? Do you feel like your representative in government is more concerned about his welfare than yours? Do you worry that your bank and credit card company rip off, rather than look after your savings? Have you stopped complaining, because no one seems to care whether you are a satisfied customer or not? Have you had to wait and wait on the phone or stand in a line for hours? Welcome to our modern world. Markets are global, technology replaces people. We have become numbers, rather than human beings. I invite you to get off this treadmill where we do not seem to matter and join a new movement. Join us to become a Pruppie like my wife Merri and me. Pruppies are those who use changes in technology to integrate the best features of Preppers and Uppies. We all know about preppers. They believe that the world, as we know it, is about to end.And we also know about Uppies, upward professionals as in Yuppies, young upward professionals. Uppies expect their world to get better. The reality is that the world might get better or it might get worse. Chances are it will be better in some places. Other spots will get worse. Pruppies are those who will gain either way! I invite you to join Merri and me as Pruppies, because we expect the world to get better. We live and earn based on that expectation but we also prepare for bad times as well as good. Just in case… the world goes sideways… we Pruppies will still survive and prosper anyway. We do not give up anything by being prepared either. We can enjoy the good parts of the new economy, as we protect ourselves from what can be bad. We pursue our passions in an incredible new economy that’s opening up for those who learn how to start multi dimensional micro businesses, tiny businesses that offer multiple streams of income in good times but can work well in disaster scenarios too. Here’s an example… there are special opportunities in medicinal crops. One of the best kept secrets is that 125 medicinal crops, that are currently unsustainable, can be grown on land that is wonderful for low stress living and is extraordinarily cheap to own. Take Ginseng as an example. This is a crop with enormous upwards potential due to growing demand in China as well as the Western world. Pruppies do not accept just the established wisdom. They look for secrets and one secret is that in parts of the Pacific Northwest Ginseng was an important crop for the local economy there before World War I.
Ginseng… according to the establishment…. does not grow there. This example shows how looking for secrets creates opportunity. Pruppies look for ways to make life better in non establishment ways. New technology creates many new ways to earn multiple small streams of income that have been forgotten or were previously unknown. Ginseng and Goldenseal growing in our back yard. 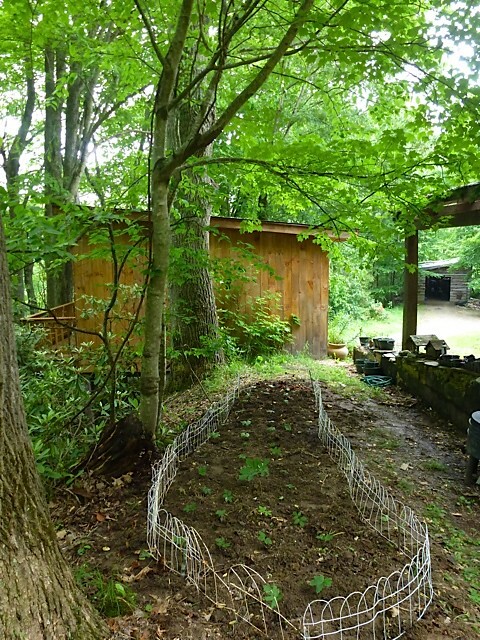 (I know about growing ginseng and want to show you how). But enough about ginseng. The earning potential of this medicinal root is just one small example of how to create large earnings in many small ways. Let me hasten to add, I am writer, publisher and investor, not a farmer. Yet I love agriculture and low stress rural living, so I earn multiple small streams of income in agriculture, plus enjoy the benefits of growing and raising some of my own medicine and my own food. The small agriculture ventures that Merri and I do are fun and each activity earns a little, plus helps us have better health. Gardening is good exercise. Eating the fresh food we grow is better than any food we’ll find in big business super markets. If times turn tight our small agriculture enterprises could become big… in lifestyle terms because I turn my passions into income. Here are sun flowers I grow. These sunflowers can be made into bouquets and floral designs that stimulate my artistic bent and sell well at the local farmers market. Anyone can make good money in small time agriculture and its a growing trend. Pruppies earn in numerous ways. Here is what Merri and I do. We have our self publishing business. We have traveled globally for decades… tax free and financed by our publishing business. Writing is a great way to earn. 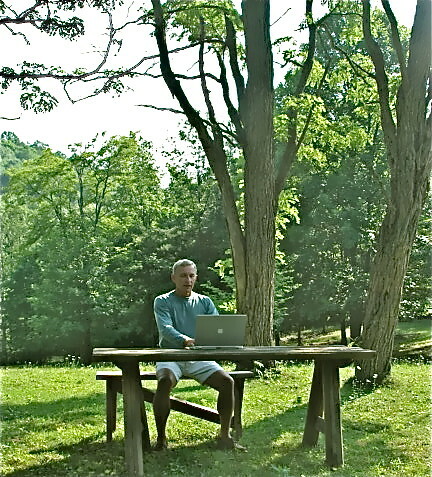 Writers can work where they want, (here I am writing away in the woods on our Blue Ridge farm). In the winter, I work at our Florida home instead. We have other mirco businesses businesses as well. For example, we have an orange grove. Not a good earner right now with citrus greening but with huge fringe (AKA known as tax breaks) benefits. We have a real estate rental business with annual leases and we also rent though airbnb. We raise trout which we sell locally in North Carolina. There are many benefits in having numerous ways of earning. First, each activity is enjoyable… for us. Our hobbies are, art, fishing, agriculture and music? We use each of our passions to create a small business. This stops us from becoming bored or burned out. A passion or interest, not the money, is always the starting point we use to find new ways to serve and earn. Second, the diversification increases the odds that we’ll always have enough income. Something always seems to be hot so we never live beyond our means. When you join us as a Pruppie you join a family of like minded souls who are looking to improve their lives by improving three basic qualities of real freedom. #2: Low cost natural health. #3: Safer, more profitable, easy to make value investments. Many club members find that just one of these three benefits makes membership worth while, but using all three provides added value. 27 years ago Merri and I created the International Club as a way for readers to join us and be immersed in all three of these benefits. The International Club is a year long learning program aimed at helping members earn worry free income, have better affordable good health and gain extra safety and profits with value investments. Join us to gain real freedom in 2018. #1: The first quality of real freedom is the ability to earn through service. Have you ever wondered, “do I matter as a person any more”? Certainly the hectic inhumane modern social structure where business and government all treat us as a number run through a system can make us ask such a question. This is a life and death question. The establishment, business, government, law enforcement, health care, education, everything big has grown so large and so computerized that we don’t seem to matter as human beings. It is Fun & Fulfilling to Matter. We can regain a true form of importance, fulfillment, wealth and freedom by serving others in a profitable way. A multi dimensional micro business creates freedom as it redesigns your lifestyle by bringing profit, fulfillment and peace of mind, by helping others as you do what you love. The way to maintain freedom through service and continual lifestyle reinventions is to “Go Try Things”. Today we have a global income with a self publishing micro-business with readers around the world, but run from our current homes in Smalltown USA. May I share how to regain control in the valuable report, “The Pruppie Factor”. I’ll give it to you free, no strings attached. As you will learn in this report, I became famous in a very small way (remember small is good) by being one of the first writers and publishers to recommend global investing 50 years ago. Everyone thought I was crazy then. Then we led investors to Hong Kong, London, Switzerland, Austria, the Isle of Man, Dominican Republic and Ecuador. In 2009 after more than 40 years of residence, business and investing around the world, I returned to the the USA to enjoy a more carefree, simplified life in the countryside and Small-town USA. If you are thinking about a simpler life in Smalltown USA, you have made a good choice. Merri and I could live anywhere I want, but chose to live in the USA and on properties in rather remote rural areas of Appalachia and Central Florida. Background. I started buying real estate at age 19. Since that time my wife and I have purchased real estate in five states in the US and eight non US locations, Fiji, London, Gloucestershire, Isle of Man, Hong Kong, Dominican Republic, Ecuador both on the coast and in the Andes. We have owned everything from an old manor house where construction was started in the 1700s. Here it is, Forwood East in Minchinhampton. Princess Anne was our next door neighbor, but we bought this house for a song. This is our front yard at Rosasamba, our 962 acre hacienda deep in the Andes, about an hour and a half outside Quito, Ecuador. In each case we used the same process to find and buy real estate. Price was never the only key in these investments. Our decisions have been based on having a better lifestyle and how it helped create multiple streams of income. For example Rosaspamba was purchased with the idea of creating a healthy and remote healing center. We seek value within a particular market created by distortions in unrealized utility and value to our lifestyle. In other words we look for property we love, where we want to live and that can help us earn extra profit. These values are more important than price. There are are specific places where you can reduce your living expenses and easily increase your income. Scientific research has shown that being in such places actually make you smarter and healthier. Top this off with the fact that they provide tax benefits. Learn about these specific places. Learn what makes them special. Discover seven freedom producing steps so can find these places of opportunity. The answer to a better, freer life is to combine better health, higher income and greater savings for a happier, more resilient lifestyle. This program is offered at $299, but is available to club members free. #2: The second basic quality of real freedom is natural good health. None of us can be truly free until we wrest ourselves from the grip of the expensive, big pharma fueled, health care system. Plus it has been proven that we can live longer by living in rural settings. According to a study at the Harvard T.H. Chan School of Public Health there is an amazing correlation between living in a home surrounded by greenery and longevity and mental health. The study of more than 108,000 subjects across America found there was a 12 percent lower risk of death for those who lived in the greenest surroundings. Subjects with the greenest vegetation around their homes were 34 percent less likely to die of a respiratory-related issue. They also found that those living in the greenest environments were 13 percent less likely to die of cancer. The researchers were quite surprised by this strong correlation that also extended into mental health. Subjects living in the greenest environments were happier and less depressed. 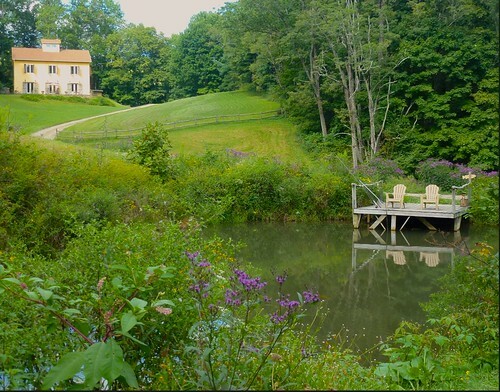 Imagine how working at our trout pond that sits just below our North Carolina home helps keep us stay healthy and relieves stress. I have been studying how to have natural health for decades since I first connected the relationship between good health and wealth over 45 years ago. Over these four and a half decades as we traveled the world, Merri and I have kept a continual watch for new ways to be stronger, more flexible, in better shape and more immune from disease. After decades of study with experts in Chinese and Indian medicine Merri and I moved to Ecuador and lived and worked with an Andean shaman for years. Merri and me with Andean shaman. We learned that good health and longevity come from easy, low impact internal exercises, good nutrition and deep sleep so our bodies are fit and strong and our minds clear. Club membership shares ways to be free of the “Secret Hospital Charge Master”. Just as governments hide truth behind “National Security”, big health care businesses hide medical truths behind “Charge masters”. Most hospital charge masters are secret because big business does not want us to know how much hospital costs have risen. Motivations beyond our good health, like corporate greed, want to keep us in the dark about health care cost. Often, what patients catch in the hospital can be worse than what sent them there. Governments and health care agencies agree – antibiotic resistance is a “nightmare.” An antibiotic-resistant bacteria may be spreading in more hospitals than patients know. About one in every 25 hospitalized patients gets an infection and a 2013 report from the Journal of Patient Safety showed that medical errors are the third-leading cause of death in the country. Each report is available for $19.95. However club members receive these three reports worth $59.85 free. The Third Quality of Real Freedom is Safe, Profitable, Low Stress, Good Value Investing. Club members participate in an intensive program called the Purposeful investing Course (Pi). The purpose of Pi is finding value investments that increase safety and profit. Learn Slow, Worry Free, Good Value Investing. There are seven layers of tactics you learn with Pi. This is a complete and continual study of what to do about the movement of international major and emerging stock markets. The Pi subscription is normally $299 per annum but club member receive Pi at no charge and save an additional $299. Plus get the $39.99 report, “The Silver Dip 2017” free. The report explains the exact conditions you need to make leveraged silver & gold speculations that can increase the returns in a safe portfolio by as much as eight times. The report “Silver Dip 2017” sells for $39.95 but club members receive it free as well. #1: The $299 Personal investing Course (Pi). Free. Plus more… for an entire year. all at no additional fee. The club membership entitles you to everything I publish for a year. Click here to become a member at the discounted rate of $349.